You can add up to 25 miles an hour and more to your swing speed by taking advantage of your hidden, built-in swing speed multiplier. The top pros have always taken advantage of their hidden swing speed multiplier. It's why they drive the ball 280-300 yards The average golfer does not know he has a swing speed multiplier built into his own body-and drives the ball 210-220. What is the swing speed multiplier built into every golfer? And how does it affect swing speed? It is a hidden lever system that multiplies any increase in hip speed 25 times. 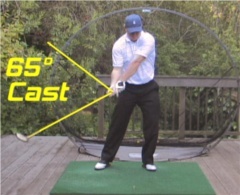 Watch this short video to learn about your hidden swing speed multiplier. Somax Hip Trainers ordered Sun-Thurs ship the next day. Orders Fri-Sat ship the following Monday. All orders shipped by Fedex Ground (no P.O. addresses, please) with tracking. A tracking email will be sent to you when it ships. Delivery is five business days or less. Canada orders ship by US Priority Mail; delivery can be up to two weeks because of Canada Post. Hawaii, Alaska and International orders shipped by Fedex Economy Air with delivery in five business days or less. Customs fees and duties for international shipments are not included in our prices and are payable by recipient at time of receipt. I purchased the Power Hip Trainer on January 4th, 2010. I use it 3 days a week. When I bought a new driver last year my swing speed was measured at 99 mph. I bought a swing speed radar this year to keep track and my best so far this year is 126 mph. My average overall is between 113-120 mph. I'm 54 years old. I golfed with 3 guys the other day and they said whatever your doing, keep doing it. I was hitting my drives close to 300 yards, but the biggest surprise to me was that they were going dead straight. I usually slice the ball big time, but I didn't hit one slice. 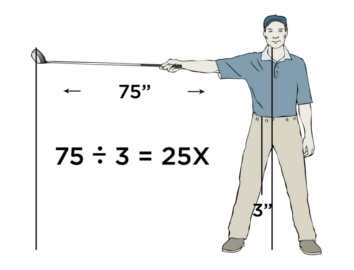 As you saw in the video, this lever system, or swing speed multiplier, is the ratio between the distance of your hip joints to the center of rotation, and the distance of the club head to the center of rotation. The distance of the hip joint to the center of rotation is 3 inches. 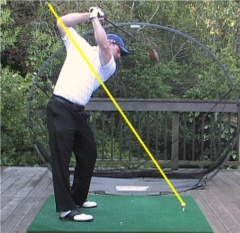 The distance from the club head to the center of rotation is 75 inches. 75 / 3 = 25. Any increase in hip speed will be multiplied 25 times at the club head. It is the easy, effortless way to add 25 mph to your swing speed. You may be more familiar with another speed multiplier, this one inside a toy propeller. You know that you can get this toy propeller to fly by turning the stick, but you can't get it to fly by turning the propeller. That's because there is a speed multiplier hidden inside this toy. 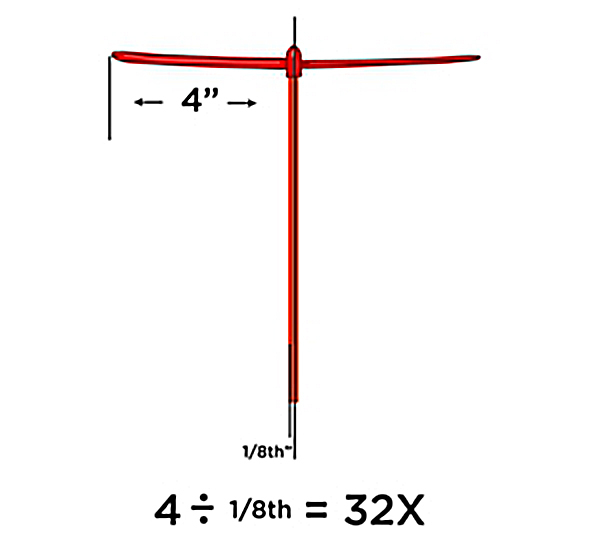 The distance from the outside of the stick to the center of rotation is 1/8th of an inch. The distance from the tip of the propeller to the center of rotation is 4 inches. 4 / 1/8th = 32. The speed you turn the stick will be multiplied 32 times at the tip of the propeller. When you try to turn the propeller, there is no leverage. The propeller can't fly. It's the same in golf. There is no leverage in your arms. The leverage is all in your hips. That's why, if you want to increase your swing speed, it makes more sense to increase the strength and speed of your hips than to increase the strength of your arms. There is no leverage in your arms. Period. So how do you get your hips to go faster? You can't do it just by trying-- because your brain has a speed limiter that controls your hip speed. You need something to break that speed limit. That something is the Somax Power Hip Trainer. 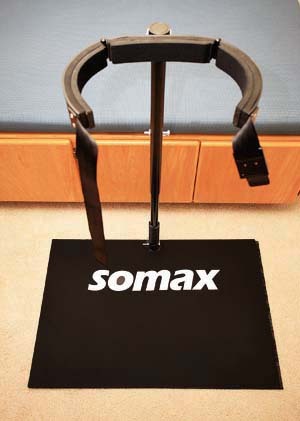 The Somax Power Hip Trainer is the only exercise machine that increases the strength and speed of your hips so that you can easily add up to 25 miles an hour to your swing speed. 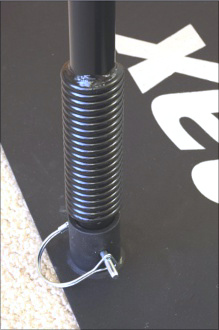 Built into the base of the Power Hip Trainer is a special heavy-duty steel spring that provides resistance to rotation. This resistance increases the strength of your hip muscles and the speed of your hips. Most golfers have very weak hips. Research has found that scratch golfers, however, have the strongest hips of all golfers tested. Here is a short video that will show you how to test your hip strength at home. If your hip muscles test weak, then the Power Hip Trainer is going to make them stronger. Again, research at a major university found that scratch golfers had the strongest hips of all golfers tested. Increasing the strength of your hips will not only increase your swing speed, it will also lower your handicap. Here is a short video that shows how to assemble and use your Power Hip Trainer--the world's most effective swing speed trainer. The special heavy-duty steel spring at the base of the Power Hip Trainer adapts to each individual golf posture while providing the resistance you need to build strong fast hips--and effortless swing speed. First, you warm up with the padded steel hip cinch in the neutral position. This also stretches your hips to increase flexibility. Tight hips are the major cause of back problems and slow swing speed in golfers. Next, you turn the padded hip cinch to the closed position to increase the resistance. Here you work on your hip strength and swing speed. Finally, you turn the padded hip cinch to the open position. The heavy duty steel spring at the base will turn your hips faster than you can turn them yourself--helping you break through your hip speed and swing speed limit . Many golfers know that they cast their clubs, but they are frustrated when it comes to changing this swing fault. The reason it is so frustrating is that they try to reduce casting with their hands. They try to 'hold back their release'. This strategy does not work because the problem is not in the hands. What causes casting is slow hips. When the hips are slow, the brain tries to make up for it by overusing the arm muscles. This is what causes casting. 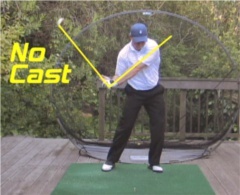 When our golfers increase their hip speed with their Power Hip Trainer, they find that they automatically stop casting. In fact, the faster their hips, the more they lag their clubs (as you can see here) and increase their swing speed. Another problem caused by slow hips is slicing. 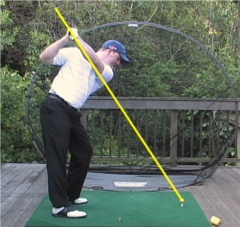 Again, golfers and instructors try to fix slicing by changing the way the arms move. Golfers slice when they come down over the top of their swing plane. This imparts a spin to the ball, causing it to slice. As with casting, coming down over the top is caused by overusing the arms to make up for slow hips. Increasing the speed of your hips with the Power Hip Trainer automatically gets rid of the slice. As the hips speed up, the arms and club are pulled down under the swing plane, and the result is longer, straighter drives and higher swing speed. You can see the difference in these photos. You will notice as your work your hips that you are starting to sweat and breathe harder. The Power Hip Trainer is not only training your hips--it's also training your heart. Walking the course cannot give you the aerobic exercise you need for a strong, healthy heart. Treadmills, ellipticals and stationary bikes are boring. Running makes your hips stiff. But the Power Hip Trainer engages your mind as well as your body as you take your hips from amateur to pro status--increasing your flexibility, strength and swing speed. Your Power Hip Trainer comes with a 90-minute DVD that contains 26 drills for right and left-handed golfers. It also has a special transition drill you can do with your clubs to transfer your new, faster hips to your swing speed. Try our new Power Hip Trainer for 30 days. If you are not completely satisfied, if you do not think that this is the best golf training aid you have ever used, if you don't feel and hear an increase in your swing speed, please return it for a full refund, less shipping. The Power Hip Trainer also comes with a full one-year warranty on parts. Does your wife play tennis? Do your kids play baseball, football, basketball, soccer or swim? All these sports and more require strong fast hips. The Power Hip Trainer will benefit your whole family. Before you purchase a Power Hip Trainer, it is important to measure your hip flexibility and test your hip strength. Lie on your stomach on the floor. Keeping your knees together, bend your knees 90° so that the soles of your feet point straight up toward the ceiling. Keeping your knees together, move your feet away from each other. If you have enough flexibility in your hips, you should be able to move your feet apart a total of 120°. That is 60° on each side. You need a minimum of 45° on each side to benefit from using the hip trainer. If you don't have 45 degrees, your hips are too stiff to turn fast no matter how much you increase your hip strength. If you have less than 45 degrees on each hip, take a look at our Microfiber Reduction program, which can increase flexibility 100% beyond stretching. A simple and accurate way to measure is to have someone get down on the floor and take a photo your legs in this position. Then get a print of the photo. As shown above, draw vertical lines through your knees, a line through the center of each lower leg, and measure the angle between the two lines with a protractor (available in any office supply store). Be sure to take the time to measure. Don't try to guess! If you are not sure how to measure, send us your photo and we will measure for you. With your feet apart and knees together, have someone hold your feet apart as you try to bring them together (be sure to consult with your physician before doing this test, especially if you may have any knee problems). The hip muscles that you use to bring your feet together are the gluteals: the gluteus maximus, medius and minimus. These are the largest muscles in your body (that's why the biggest of them is called 'maximus'). If you're like most players, you will not be able to bring your feet together at all. If you can bring them together, it's only with a lot of effort. What should you be able to do? If your hip muscles are strong, you'll be able to bring your feet together so powerfully that you can throw your friend back across the room. That's the power potential of your hip muscles! If you have at least 45° of internal rotation on each hip and your hips test weak—then the Power Hip Trainer is for you and will transform your game as you increase your distance and control. I hope you are doing well. My name is David Schreyer and currently an instructor for Braelinn golf club in Georgia. I just purchased your hip trainer this evening on your website. One of my students told me about the trainer and invited me over to try it out to see what I thought. A little about me, I am a 17 year tour veteran. I player one year on the PGA Tour, 5 years on the Nationwide level, 9 years on the Hooter Tour and spent my winters on the South African PGA. I had 19 professional Victories and several mini-tour wins. I am second in wins with 10 wins on the Hooters Tour. I also won three money titles on the Hooters Tour. In 97 I had the lead in the middle of the second day of the US Open at Congressional. All that being said I was always a pretty big hitter. The highest I have ever been clocked was 123 and I was maybe 29 then. I am 45 now and I don't play much anymore, as I am a very busy teacher. I haven't seen my swing speed faster than 115 in years. So hence the reason I am writing you. I clocked myself today for about 10 swings and the fastest swing was 115, then I got on the Somax hip trainer and worked out on it for ten minutes. I got off the machine and I felt really good. I then hit balls and couldn't believe what I saw. My first swing was fast at 118 and I was excited. Then it happened, my next swings were 121, 127, 122, 128, and 124. I leveled off at 122 smooth and topped out at 128. I have to tell you I have never come close to 128 and I'm 45 years old. Just ten minutes on your machine. I can't wait to see what is possible. It kind of makes we want to see if I can get competitive again. Looking forward to its arrival. This trainer is the real deal! I am going to recommend your trainer to my students. This is exciting! Great drills for the Power Hip Trainer. All the info I have received is excellent. The movement of my feet, ankles, knees and hips that you teach in the DVD are really helping my game in tournament play,dropping my scores to under par in competition. These moves I felt every once in while in a good swing but was never able to train the brain to know what the actual move was. The hip trainer finally trained my brain. Very good practice drills and swing thoughts. This is just to let you know that I have finally got going on the hip trainer. I have about 12 hours in on it and I already notice a real difference. My hips are so much quicker! They get out of the way earlier which really helps my swing and keeps me in better balance. When I combine the left knee first and faster hips, it is such an improvement. You might remember that I had been taught the bump move years ago and as a result swayed forward a lot on the downswing. It is amazing how quickly the hip trainer has overcome that flaw. It motivates me to keep working on it all winter. By the way, I happened to catch an episode of "golf my way" by Bobby Jones the other night on golf channel. There were many slow motion views of his swing. You were so right about his left knee leading the way in his swing - even while he was still finishing his backswing. A picture is worth a 1000 words. As you know, I am a pro golfer and have played in events on the Canadian Tour, AG Spanos California Tour and Golden State Tour. I had some success in my tournaments, but not enough to where I could make a significant living off of it. I knew I had to make changes to my game to increase my distance and accuracy. I started working with your Power Hip Trainer in the Fall of 2006. When we began, I had no idea how to utilize my hips in my golf swing and how much potential power I was wasting because I had weak hips. Within two months of working on the Hip Trainer my hip strength increased exponentially and I gained an extra 20 yards off the tee on my average drive, and hit my irons one full club further. Even though I am only 5'10" tall and 150 pounds, I can still hit my drives consistently between 290 - 300 yards and past the bigger and taller players in my group. By retraining my body I have become one of the top players in the Northern California PGA Section and look forward to more success out on tour. As you know, I am an exempt player since 2003 on the LPGA Tour. I also won 1st place at the Ladies European Final Stage Qualifying School in 2004, so I also play the Euro tour. Although I have not been able to compete in 2007 due to a skiing accident which required surgical intervention, I wanted to let you know how much I enjoy and value your Power Hip Trainer. When you first tested my hip strength I was shocked to find that my hips were very weak, even though I am a professional golfer competing on the LPGA Tour. I was also disappointed because I had spent 10 years strengthening my body with various fitness 'gurus', yet none of them specifically trained my hip rotators. They were more concerned with the other muscles. As a result of over-training with weights, I developed a lot of scar tissue, which you had to release so that I could make a full swing. Since I have started to work with the Power Hip Trainer I have gained about 10 yards with the driver and I am starting to draw the ball vs. putting a weak cut on the ball which used to create a lot of backspin. Now my ball has less backspin which makes the ball roll out a lot once it hits the fairway. I love to train with the hip trainer because it improves my technical downswing faults that I was never able to get rid of with any coach during my 10 year career. I know that once my knee heals and I learn how to really recruit all the hip muscle fibers, I will be able to use the hips much more efficiently and the faults in my club swings will correct themselves. I can already see these improvements after training with it consistently for the last 5 months. I am starting to be more accurate with my irons and woods. The biggest difference I see is that my club has gained so much speed during the crucial point at impact. I have been playing scratch golf for more than 30 years and was not happy to see my average drive drop from 250 to 230 over the past few years. The combination of Microfiber Reduction and the Power Hip Trainer has enabled me to increase my average drive to 280, with some drives going as far as 300 yards. At 57 years of age, I am very pleased with the results. My pro has been telling me for years to get my lower body into my swing, but I was never able to do it until I started working with your hip trainer. After the first week of practice, I could begin to see a difference on videotape. Now I'm starting to hit some of the best drives of my life. I had a habit of sliding my hips during my downswing that was very difficult to break. After working against the resistance of the Power Hip Trainer, I have been able to eliminate the slide and just turn my hips. As a result, I'm more consistent with my drives and irons. My problem has been my right leg. I never felt solid at the top of my backswing. Now that I've been working with my hip trainer for a while, I feel more solid. I'm keeping my right knee bent, and can feel that I'm really driving off my right leg. I feel like I'm making better contact with the ball. My handicap has dropped from 12 to 9. I'm hitting the ball more consistently. A brutal left hook that popped up from time to time disappeared after the third week on the hip trainer. My wife now uses it for her tennis game, and our son has found it helpful for soccer. The Power Hip Trainer has been a big help to my students. The resistance and acceleration really help them work the muscles in their legs and hips. Talking about hip rotation, showing them tapes of expert golfers, and demonstrating the correct motion myself has not helped them to learn how to drive with the legs and rotate the hips like the Power Hip Trainer. 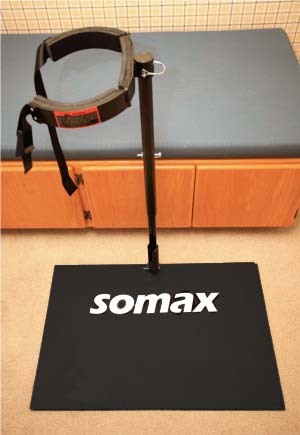 I purchased the Somax Power Hip Trainer in September 2008. My purpose for getting it was to loosen my hips as I had experienced pain and difficulty with hip rotation in my golf swing. I am a PGA Professional for over 30 years and I noticed the deterioration of my hip speed within the past 5 years. Since using the Power Hip Trainer, I've lost 20 pounds, 4 inches on my waist, and I've gained at least 30 yards with my driver! I have to say that everything you explained to me has been true. I'm truly happy with the results and I will continue with my routine and exercise. I will keep you informed as to future achievements. Thank you!! I have to tell you that in all of my 55 years of athletic involvement , I have never encountered anything close to the impact that Somax has had on my performance. Somax has changed my golf game. For 30 years, my swing was arms and hands, resulting in weak shots and chronic back problems. Now, my swing is generated from hip rotation, resulting in unbelievable power, and of equal import, absolutely no back injuries. It is laughable to me that many of my friends spend a ton of money on equipment, expecting their game to improve. 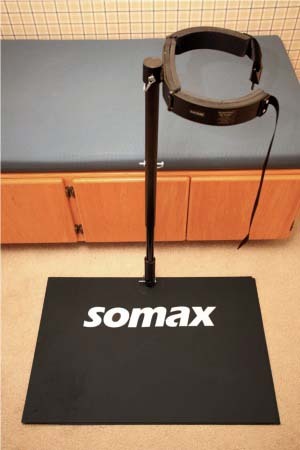 Somax revolutionizes your game. This training tool gives you a solid repeating golf swing that you can use under any circumstance. For the first time, as I stand over the ball, I have tremendous confidence, knowing that my right hip will not fail me and I will fire through the ball. Also for the first time, I actually finish on my left side and can hold that pose forever. Amazingly, as I continue to train with Somax, my hip action just gets stronger. Once I am loaded up on my right side, I can't wait to pull the trigger and fire my right hip right at the target. Thanks Bob, your design was genius and your videos are a Godsend. Since using the Power Hip Trainer my handicap has gone from a 5 to a 2 within the last card change. I also had a great weekend shooting 69/74 and placed 3rd in the state senior open. It has really opened my eyes to what a real swing should feel like in addition to hitting more quality golf shots than ever before. Not only have I gained significant distance to my game and hitting more solid golf shots than ever before, but the overall health benefits are amazing. I look and feel more physically fit and most importantly, my confidence level is off the charts. Thank you, thank you for saving my game. It's been a wonderful transformation and only getting better. In all honesty, this is truly the best investment I ever made. Frankly, it changed my life.